In an offensive game that DePaul lead by as many as nine points, the Blue Demon failed to execute over the final 4 minutes. This game was right there for the taking, but in the closing minutes a few key plays turned the tide. With just under 4 minutes, DePaul up 4 points with the ball. Strus makes a dash to the basket, there is contact, the ball goes in for what should be a 3 point play, but no, the referee called a charge. Replay shows that Tariq Owens is clearly moving whilst Strus is in the air. By definition, this is a blocking foul. The Demons got hosed on this one. About a minute late, after St. John’s makes both ends of a one and one, DePaul goes to inbound under their own basket. Maybe the other guards/players should have been more aware, however, in a minor panic, Strus throws the ball to where he thinks Cain is going to go. Classic miscommunication leads to a costly turnover. Of course, this being DePaul, the 342nd most lucky team in D1 basketball (out of 351), on the ensuing possession, Shamorie Ponds hits a dagger 3 point shot in Cain’s face. That 3 pointer put St. John’s up to stay. However, with 16 seconds left, Marvin Clark II missed a free-throw to keep the Demons within 3 points. DePaul advanced the ball down the court without any issue, and miraculously, Max Strus got an open look! In and out, also known as, the DePaul Blue Demon basketball season. 5th time that the Demons have lost by 5 or less (including the OT loss.) However, if you had any faith in DePaul and you are a degenerate gambler, Strus came through for you on the last possession, hitting a meaningless 3 to close the score to its 1 point final. There were an incredible amount of Blue Seats. There was no way that there were more than 2,000 fans there. The total was most likely below 1,000. This stated total of 4,690 is a sham total. There were a few St. John’s fans. I took my wife, and we did have a good time getting away from our kids, but all of those surrounding us, were given their tickets for free because their kid had won a reading award. I will say that former DePaul legend, Dave Corzine, came over and talked to each reading award winner and made them feel like the most important person in the stadium. That was cool. The meaningless 3 pointer that Max Strus made at the buzzer decided the gambling outcomes for many humans. The line opned at -2 for St. Johns and went as high as -2.5 for the Red Storm. Leading up to tip off, I saw the line drop to as low as -1 for St. Johns. If you got in early and picked DePaul when the line favored SJU by -2.5 and then later took SJU at -1, you were almost an extremely happy human. The bet ended up great for DePaul backers and the over with a final score of 153. In my preview, I documented how on fire Shamorie Ponds had been in his past 4 games. He kept it up. The key for Ponds over this stretch had been his ability to hit 3 pointers to open up his other options. He has a super quick shot, and if you crowd him, he has super quick feet. In this game, Ponds went for 26 points on 10-18 shooting (including 4-8 from 3 point land), along with 10 assists. His assists consistently found either Marvin Clark or Justin Simon in the opposite corners. Collectively, the 3 of them killed the Demons from 3 point land going 11-19. This crew was the reason that DePaul ultimately lost. When Marin Maric was not in foul trouble, he was excellent. He put up zero points in the 1st half with 2 quick fouls, but quickly established himself in the 2nd half. In the preview of the game, I mentioned how he had dominated the 1st meeting of the two teams. The early foul trouble diminished his impact greatly. He only played 6 minutes in the 1st half. He had 15 in the 2nd half. I was befuddled when Dave Leitao took him out of the game after scoring 7 straight points. He hadn’t picked up a foul; he only played six minutes in the 1st half; What are you doing Dave? Keep the big guy rolling and make Chris Mullin make the adjustment. Ponds was too quick, so with a little more than 10 minutes left Leitao countered with the zone defense. Logically, it made some sense, until the Red Storm brought out their zone busters, going 4-6 3 point land. It just killed the Demons. Jaylen Butz, Paul Reed, and Justin Roberts combined for 4 points, 7 rebounds and 3 turnovers in 24 ineffective minutes. Also two awesome air balls. 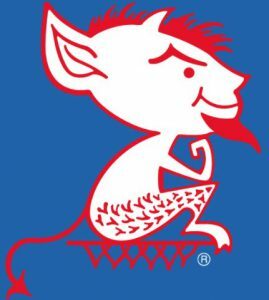 As mentioned before, DePaul has been extremely unlucky this year. According to kenpom.com, DePaul is 342nd in the nation. Only 9 teams have been more unlucky. According to the T-Rank system, DePaul is the 321st unluckiest. This game was no different. When you lose by 1, every possession matters. There were so many quirky plays that did not go the Demons way. When DePaul went to zone with 10:06 left in the game, the Demons forced St. John’s to use the entire clock. A desperation 3 from Justin Simon came from the corner as the shot clock buzzer went off, it hit front rim, went 5 feet in the air and went in. The Strus non-charge. This call alone may have swung the game. Owens was sitting on 4 fouls. If this is called correctly, Strus has a chance for a 3 point play, and Owens, St. John’s defensive shot-blocking savant, is out of the game. Critical bad call by the referee. The miscommunication of Strus and Cain was basically an unforced error at a critical time. Cain turnover with 1:13 left in the game. He drove right sideline into a pseudo trap and lost the ball. At the time, DePaul was down 2. Strus getting a great look for a tying 3, and the ball goes in and out. DePaul couldn’t finish the Red Storm off. The Demons let another one get away. What could have been with a few timely baskets this year?